Dear My children, also today My Son Jesus is sending Me among you, so that you, My children, don’t lose hope. Today, more than ever, My Son gives Me the grace of staying among you so that, through My coming, I can guide you and show you the path of light that leads you to My Son Jesus. My children, it’ s been for a long time since I’m among you to open your hearts, so that you, My children, may learn to welcome Him. Only in this way, My children, you’ll be able to find peace in your hearts. I’m exhorting you, My children, to decide with perseverance to welcome ever more God’s Word, which is given to you every day. My children, if the desire of welcoming It isn’t born within you, you can’t discover and taste His love and His tenderness. Taste Him, My children, and you’ll see how great His mercy is! I’m saying to you, My children, who seek and desire peace,: peace can be achieved when there’s a heart full of love within you! And I, who have long been coming to take Me your hearts, that are full of suffering and pain, don’t be afraid to give them to Me! As a Mother, I come to heal them from every spiritual disease, so that you may be converted and the flame of your hearts may be lit. Pray, My children, pray, pray so that you become the true Apostles. They’ re many who don’t live an ordered life, as if they’ d never known God’s love. And you, who know God’s love, I’m exhorting you not to scandalize your children, but return to pray and to fast in your families, so that they can welcome His love. I stare at each of you and touch your hearts. I’m blessing you all. This Message is Christological. Mary insists to say that She comes in the name of Jesus. The Blessed Virgin reiterates on the theme of God’s Word. She says that She has been coming for a long time. Why are elementary conversion lessons not understood? 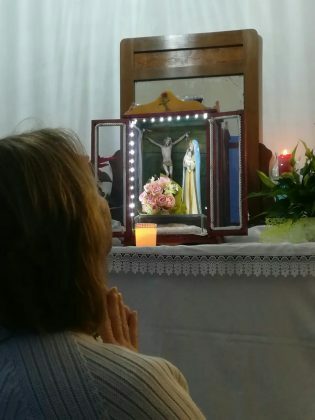 I’m exhorting you… to welcome ever more God’s Word that’s given to you every day… to discover and taste God’s Love and His tenderness… It is probable that they be the daily readings of the Holy Mass… For many faithful are the main spiritual reading. Let’s do an examination of conscience about it. Peace can be achieved when there’s a heart full of love within you. It seems a trivial evidence. But, at last, we find there, the key to so many disturbances, of so much anguish. For example, when we have the feeling of wasting time, of not being productive, of being too good, of rendering useless, unrecognized services, etc. And I, who have long been coming to take Me your hearts, that are full of suffering and pain, don’t be afraid to give them to Me! As a Mother, I come to heal them from every spiritual disease, so that you may be converted and the flame of your hearts may be lit. Mary is full of compassion for “Mary’s Pilgrims”. Let’s measure the weight of the expression: “to take Me your hearts”. What does it mean to give own hearts? It seems abstract and artificial. In what sense does this proposal become strong, maternal, warm? Mary did not come first to do miracles on bodies but to heal spiritual diseases. The main and almost unique spiritual disease, the cause of so many evils, would be the fact of not loving? And you, who know God’s love, I’m exhorting you not to scandalize your children, but return to pray and to fast in your families, so that they can welcome His love. When the consideration of losing eternal life through conjugal infidelity, for example, is not enough; we can think of the definitive prejudices caused in the children’s soul. Moreover, at the beginning of the year, it would be useful to make a public examination of conscience on our practice of fasting in each Prayer Group. I stare at each of you and touch your hearts. I’m blessing you all. Abysmal mystery of Mary’s universal mediation! How does She get to be concretely present to billions of angelic and human beings?